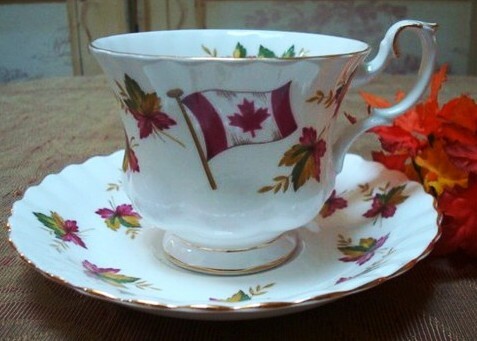 This is a glorious Tea Tuesday in Canada as we count down to one of our most loved long weekends: Victoria Day, celebrating the birthday of Queen Victoria, our first sovereign queen. May 24th marks her official birthday, but the holiday falls on the last Monday before May 25. While still proud of our English heritage, this holiday takes on a special meaning marking the changing of the seasons. The fear of frost has passed so many will be planting their gardens–which is what I will be doing–and city dwellers will be fighting horrific traffic to enjoy Canada’s beautiful lakes, mountains and forests. Also known as the May Two-Four referring to the Queen’s birthday and the Canadian slang for a case of twenty-four beers (a “two-four”), a drink popular during the long weekend. Each week I host Tea Tuesday, a virtual tea party which was inspired by Christine, a follower who lives in France, who was curious about English tea traditions. The British may have failed miserably in other culinary areas, but they excel in the tea ritual. The English Tea Store Blog Quizzes: Are you a Serious or Smart Alecky Tea Drinker? Queen Victoria reigned for 63 years (June 1837 to 22 January 1901), a period we know as the Victorian Era. After she died Edward VII, was left the keys to the throne, and partied his way through the Edwardian era until his death in 1910 from a double heart attack. I often refer to this period of history as Eddie’s Era, a decade of decadence and frivolity for the wealthy land gentry which would end with the First World War. It was a great party while it lasted. Queen Elizabeth II is Queen Victoria’s great-great-granddaughter, celebrating her Diamond Jubilee this year, and by the looks of things is well on track to surpass Victoria’s 63 year reign; she certainly has been a more dignified ruler than her great-grandfather. 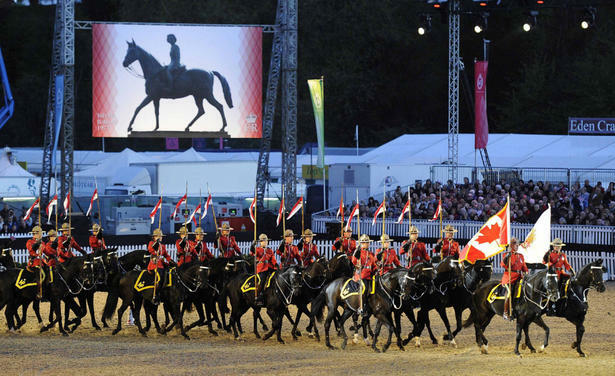 Canadians can be proud that our renowned RCMP Musical Ride team participated in one of the first major Jubilee celebrations this past week at Windsor Castle. I have seen them perform many times and the precision of this team always amazes me. As a bonus, our Canadian Tenors performed Hallelujah (written by Leonard Cohen, another great Canadian) at the Queen’s request. If you recall our earlier lessons on the origins of Afternoon Tea, it was one of Queen Victoria’s Lady’s in Waiting who came up with the great idea of having food with tea in her chambers to bridge the gap between lunch and late dinners. After the death of her beloved husband Prince Albert in 1861, Queen Victoria withdrew from society, but was eventually encouraged resume her civil duties by hosting her own tea parties at which a sponge cake would be served. The cake was named after her and became fashionable throughout Victorian England, and has been passed down through generations. Perhaps Queen Victoria’s reintroduction to society through tea and cake was the secret to her longevity. This is a great dish for beginners since you don’t have to worry about icing. 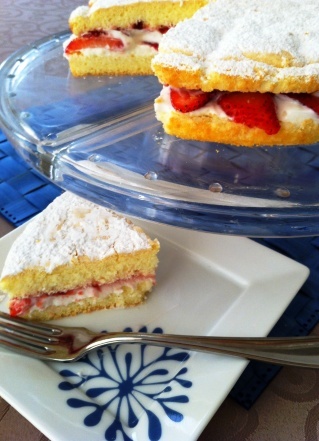 A traditional Victorian sponge consists of jam and whipped cream sandwiched between two layers of sponge cake. The top of the cake is generally not iced or decorated, except for a sprinkling of confectioners’ sugar, sometimes over a doily to create a lacy pattern. Traditional sponge cake is loaded with fat calling for equal amounts of butter and sugar. Whipping the egg whites separately gives the cake that light fluffy texture. Cornstarch acts like custard powder without any preservatives or artificial yellow food coloring. This is a great light cake you can take up with you to the cottage this weekend and assemble when you get there. It can be filled two different ways, with jam (no sugar versions, please) or with strawberries and greek yoghurt which replaces the original nasty whipped cream. 1 cup non fat greek yoghurt, mixed with honey to taste. Separate eggs. Beat egg whites and salt until stiff. Add sugar gradually and beat until stiff and sugar has dissolved. Add egg yolks. Beat until well blended. Sift together cornstarch, flour and baking powder and fold into the mixture. Pour into a (8 inch) greased and lined cake tin. If you have a smaller tin you will get a thicker cake. Bake at 190c (350 F) for 15-20 min or until cake springs back when lightly touched. Leave in cake tin for 10 min before turning out onto a wire rack to cool. Slice cake in half so you now have two layers. A long serrated knife will do the trick. Spread your preferred filling on the bottom layer (jam or strawberries and cream) and top. Dust icing sugar on top. What a gorgeous day, perhaps tea time today might be held in the garden? I do love a sponge cake, so light and airy. I am thinking the same thing and you have such a lovely garden. Unfortunately, the sponge cake is only as light as the ingredients you put in them. Most are loaded with butter…that’s why they taste so good, so after a few experiments got a nice light version that Lord D adores. Lord D is very lucky to have such a conscientious personal chef. How come we can’t celebrate Victoria’s Birthday?!?! Harumpff…sigh…sounds fun. just one of those British Colony perks that we took advantage of. As I recall you live in relatively warm part of the universe, Pat so you should allow us Cannucks to catch a break here and there! Thanks so much for this recipe! I have been searching (in vain) all day long, looking for just this recipe & no luck. A good looking, light Victoria Sponge recipe ~ just doesn’t exist. Or so I thought….then tonight I see this post on Facebook. All I can say is YOU ROCK! I’ll be making this for the weekend, our strawberries in the backyard will be ripe by then. Many thanks! just in time! It always annoys me to see recipes loaded with fats and white sugars. Besides making healthier choices, I think of my eating choices like shopping on a budget. I know I have only so many calories in my account and I want to eat as much as I can within that limit… or exercise more to keep everything in balance. So if I am determined to eat cake, I will make it as healthy and guilt free as possible. I have to thank you for your inspiration. Your blog is lovely and the gardening board on Pinterest is giving me lots of ideas and I repurpose a back corner of our backyard for more garden. Out on the farm you have tons of land to grow a garden. In the city you have less space and it should look pretty as well. Enjoy your Victoria Sponge, and sorry you don’t get a holiday like us Cannucks this weekend. How kind…I do like to use jam in combination,as it does help keep the layers together. Traditionally it is just jam and cake, but I know you just finished a big batch of jam so you were good to go! You did the recipe justice! Do you not allow comments on your blog? I couldn’t seem to find a spot anywhere to give you kudos! So now we are pairing food with cutlery! Where will the madness end? I think you will enjoy the comments section. People from all over the world are always so kind to come by, say hello and share a kind word or experience. Love the sounds of this sponge cake Pam. I’ll tuck it away for a weekend that I have some yummy local strawberries to go with it. there really should be a law that Canadians serve it on Victoria Day…washing it down with beer.. or not..